All reviews are un-edited and have been transcribed exactly as spelt or presented in the original source. Cats were jostling to get close to this as soon as it was plugged in and it appeared to settle them. They seen to love it. It is a bit smelly though. Bonfire night, and New Year both passed without any stress, much better for dogs and owners alike! My 3 year old Yorkie would shake and pant uncontrollably all night long from just the sound of slight wind or rain, and fireworks, motorbikes etc would make it ten times worse. We have tried everything, even anxiety medication from the vets and nothing worked. Within the first couple of days of using this plug we noticed a huge improvement and now it’s like she is a different dog. If it is windy or rains, she will just curl up on the sofa beside you, no anxiety at all!! Worth every penny and will continue to order! Works well. Would recommend. Used for dogs, cats and parrots. Arrived quickly. Good price. Bought these as a replacement. There was some tension between the dogs in the house. They settled down within hours of plugging the diffuser in. Great set at good price (my vet recommended) cat brought for not used much of the products yet but handy to have if there is an issue. My dogs behaviour had suddenly changed after staying at a friend's whilst I was in hospital. My usual chilled, happy dog seemed hyper alert and was running to the front and rear door whining, refusing to go toilet in the garden and when resting he was shaking. I sprayed this product on his beds and within a day he was back to himself again. Such a relief!! People mention the smell of the product in the reviews. After an hour the smell disappears so please don't let this put you off. Smells nice and it’s used on our dog and hedgehog. Settles the dog for travelling. Definitely buy again. Bought this for our 5 month old indoor rabbit and it worked a treat from the moment it was plugged in. No more chewing the carpets from him either! He was relaxed and content from the get go after just a day! We use your spray and wipes to keep bunnies and Guinea pigs relaxed on there holiday. Thank you for such a amazing product. It smells a bit weird to start with but it works wonders in keeping my jumpy house rabbit calm. I thought I must share this with you guys at Pet Remedy. If you remember we spoke about our new puppy not sleeping long at night 2-3 hours max and we spoke about different options. We decided to go with the heat pad. We/I’m so happy we did as he slept a whole 6 hours. Woke at 5 for a wee then went right back in his cage until 8:30. !! There’s either some kind of witchcraft going on or the heat pad is as good as you say it is !! Thank you for a great product and a great nights sleep! Does what it says on the packet. My Westie is a lot more sociable and calm when meeting strange dogs. We can’t live without this. Bought it originally as a Last resort to help with severe separation anxiety. That was 8 years ago and we haven't looked back! Not only does it work on my dog but I can tell when it's running out as my husband starts to get grumpy too!! We keep ours plugged in all. The time and even take it on holiday with us if we're taking the dog. Have been using Pet Remedy plug in for nearly 2 years. I have a re-homer Clumber Spaniel who was very very stressed when he first came to us. Pet remedy has helped a lot to reduce the stress - leaving us with a delightful dog we can work with. We also use the spray on his neckerchief if going somewhere he finds a bit stressful. This is a good calming spray I used it for one of my dogs who gets stressed out in my husband's car. She's fine in my car, I think its something to do with the noise of his exhaust system. The only draw back with this spray is the smell. I didn't like the smell of the spray. We used it several times for car journeys long and short, but the smell was rather strong to me. It works well and the dog responded well to it. I just had to take her bed out the car and wash her blanket each time. Amazing, worked immediately. Both my cats and ferrets love it and my home is now a little calmer. Our cat was originally a stray that we rescued. He was okay indoors but not for long periods, since we moved he has had to stay inside and this little miracle made sure that we have had a smooth transition into our new home, and the cat has been brilliant. He has stayed very calm and is not scratching at doors or windows to try and get out like he would have before. So glad I purchased this! This works! Calmed down 2 very stressed mogs during a house move. Mini Pin looks all sweet and innocent but she hates our handyman at work and goes mental at him! I actually use your products for my Jack Russell that whinges but thought I’d give the bandana a go with Mini Pin one morning at work . . . .
After trying many similar thing with no effect. I tried this after it was recommended to me by a dog behaviourist. It has been very helpful for my dog, who is rather timid and does freak at various things when we are out so I spray it on a bandana attached to her collar. I also use the diffusers. Works less 24hr!!! !Every morning my Yorkshire wake up so angry....this morning he wake up calm and easy O.O Thanks !!!! I am never without this in my cupboard - it is absolutely amazing and really does calm my dogs down. Have been having issues recently with my cat and some anxiety issues. Have used feliway diffusers before but don’t notice much of a difference in his behaviour. Bought this as recommended by me vet. Sprayed a little on my fingertips and stroked the cat. You could see an instant change in his behaviour. More relaxed, purring away and now fast asleep! So impressed by this stuff. Brought a bottle out to Pats Rescue Retreat in Spain and started using it on a little scared boy called Benji. He was physically shaking at first, but several blankets sprayed with Pet Remedy and he allows us to smooth him. I know he’s uncomfortable but we only have a week so working a little faster than I’d prefer but Pet Remedy works miracles! This product does exactly what it says it does. Been using it for almost a week now and from day 1 our 3 year old beagle was significantly more relaxed than previously. We really wish we had tried it sooner. Obviously we don't know how it will last in the long term but we are really enjoying the peace we are getting at the moment. We are not however using this in isolation - we are also making sure that we give her 2 good walks every day (and not just on some days). We are also trying to stick to more of a routine and give her lots of praise for the good behaviours and ignoring the bad when we can. To be honest we had contacted Beagle Welfare with a view to rehoming her because of the issues we were having - we know that we have caused these issues over time but are now ready and able to address them - we are awaiting an appointment with a behaviourist too. Please, please, please, if you are reading this - buy this product and recommence a training program NOW, before it gets too far. Our dogs deserve the best but we have to make an effort. I have 5 cats and 2 dogs . Within 10 minutes of plugging in this is what my ex Ferrell cat did , please see video in comments.I’ve spent the last 8 months at home due to my health I’ve just started leaving the dogs for the first time and they were trashing the house and pulling up the carpet . Our first week of using the plug in and they have been left for up to 2 hours and no problems, even calm when I return. I think I might be sending the dog cage back I ordered as there is no need for it now . I’m truly amazed. Calms my dog and cat down amazingly. There is a smell that comes from it when plugged in but it is bearable, it's not that strong. Never thought that it would work as well as it does. No need to buy 2 separate bottles at a much higher price. Will always buy this version while it's available. Great plug in for cat tensions-This is the best plug in product I have found to help ease tensions between my 2 cats. I have one in the room they spend most time/sleep in, and another in the lounge. It has really helped reduce cat fights, and the subtle fragrance from the diffuser is pleasant to humans too. I'd recommend this to any cat owners with sick or troubled cats as it really does calm them down, without any druggy side effects. Just a couple of sparys on a bandana every few hours quickly calms your dog. Smell is pleasant. Expensive but does last a while. Works great with the plug in pet remedy. Very Good For Calming Cats - Handy to have when your cats need calming. Such wonderful stuff, at the moment I don't need it, but I always keep some just in case, it has proved it's worth!!! Pet remedy is the best of its type out there; I’d tried several others but none of them work as well as this. I find the plug in useful as I don’t have to think about it; I can just totally forget about it and it does it’s job. I rather like the initial smell, it fades fairly quickly but I still get an occasional burst as I pass by. I have seen a visible change in my dog when she’s in a room with Pet Remedy. I very much like that it’s been proven to work on many animals; I think it has a calming effect on me too. It lasts weeks so it is quite economical. Hi - I’ve been using the Pet Remedy spray on my dogs and it’s been brilliant. This morning I met a dog owner with two very large standard poodles that were totally over excited and getting out of control. The owner mentioned he had tried tablets to calm them down and nothing worked. Well I had one of the free sample sachets of the pet remedy in my pocket and asked if I could use it on his dogs, it almost instantly calmed the 20-month-old and had a very good effect on the 10-month-old. I have directed him towards your website as he was very impressed with the outcome. This product was amazing from the day I plugged it in! My Siberian husky would destroy the house whilst I was at work every day without fail regardless to what I left her to chew, eat or play with. I plugged this bad boy in and have come home every day since to not one thing touched and a happy girl asleep with the cat on the sofa. Even the cats more chilled and loving. I can smell it slightly but it’s a nice smell and not at all offensive. I would highly recommend trying this plug in. Used before, who needs an air freshener when you can chill out the hounds AND change the doggy aroma! Chipping done; minimum of fuss from either cat... The fun bit was what happened next. Bear in mind I'd just jabbed a needle in each neck.. Neither cat ran off..they both went to table where the used wipes were lying...grabbed them and proceeded to roll around like it was catnip!! Instant happy chilled cats!! Wish I'd filmed it!! Owner ( dog and horse lady) was very very impressed!! Not with my stress busting cat treatment..no..it was all Pet Remedy....So another convert!! Works wonders, you get the occasional smell from it but it’s totally worth it for all the good it does to both my cat & dog. Unlike another branded one on the market, this works 👌. The smell can be noticeable but it’s well worth it to have two happy moggies 😽😸. Pet remedy diffuser has helped my sugar gliders settle in and after their castration. Highly recommend pet remedy for exotics, works with my African Pygmy hedgehog too! Pet Remedy products are above and beyond all its competitors. we run a cat sanctuary and have 22 cats. Pet Remedy is the key to all our furries living in harmony. I got this spray for my coton de tulear 3 year old dog. He has had a couple of bad experiences with a groomer and a vet. He now has anxiety when being groomed and sometimes snarls and is a little aggressive. I read the reviews on this spray and decided to try it. Am I glad I did. I even bought a muzzle to use alongside it but I didn’t need it. From the moment I put a couple of sprays on his bandana and tied it round his neck he was completely calm. I never write reviews so I must feel strongly about this. I could clip his hair with clippers and he was like stunned and licked my hand when it went near his mouth. As soon as i finished I took bandana off and he jumped down and started playing with his toys! So no after effects either. I’m so happy. Thank you to the manufacturers. I was sceptical of these sprays, but a behaviourist suggested this for a dog with very noisy separation anxiety and this has helped. Sprayed on bedding and collar this spray has definitely made a difference to him being calmer and quieter. The smell is not as awful as some reviews suggest, its just a very herby scent. Very good product for the money as works well to keep our dogs calm. Also, oddly works on me as well so I don't know what that says about me! We've been using this for about two years and are always impressed about how long each plug in lasts as we have it on all the time (roughly 3 months!). Thank you! 112 Carlota Galgos is a sanctuary for the rescue and rehabilitation of the Galgo Español. They are similar to a greyhound. But not the same. Galgos are used in hunting hares and their traumas are high. Our sanctuary takes in alot of hard fracture cases and which are traumas. Mentally spiritually. Many stay with us a long time. Many are victims of hanging. Beatings abandonment or dropping in wells. I decided to try placing in each bay (as our galgos live in wooden bays not kennels. With heating and music and comfy beds) pet remedy sprays. It has helped immensly. Infact I am overwhelmed by the results and would be proud to recommend the product. I’d read the reviews and was worried about the smell but we found we hardly noticed it. Both our dogs are more relaxed and seem less stressed. We will be buying again. Easy to use, pleasant smell and it works on our three nervous rescue dogs, they’re calmer and more relaxed. I've been buying these for a while and notice a difference in my dog when they run out. They are just as good as the more expensive version and I'm considering trying the wipes when he is in the car. I have multiple dogs/cats and although mainly fine they did used to have the odd squabble. This has stopped this behaviour. All but one of the dogs seem much calmer and all the cats are too. Also great for parrots and rescue Hedgehog. Much prefer it to Adaptil. It does have a bit of an odd odour but it's not unpleasant. Definiely worth a try. All in one kit - I have two golden retrievers. One is constantly hyper and anxious, the other seemed a bit depressed and has barking issues. They had resorted to being messy in the house. We have had this stuff a week now, from the very first day we noticed a difference. It has calmed them right down. We have only had one accident and our dog is barking a lot less. We are using the plug in and we spray the curtains. The dogs are listening to us more due to being in a more relaxed state. My husband refers to it as “ puppy dope”. I do notice that we do have to spray the curtains every couple of days to keep it’s full effects. We don’t notice the smell, perhaps due to having one of those release air freshener sprays. Highly recommend as long as you constantly spray with it. Great Stuff - Always have some of this in the house to keep our cat and dog calm. Works brilliantly. Calmed my dog with the arrival of a new puppy. She was dribbling with stress but this kept her calm. Great for fireworks also. Last night I proved to my husband how well PR works! We always have it plugged in upstairs for the cats but last night when the fireworks started (approx 8.30pm!) My two usually quite chilled labs got anxious, they were pacing, salivating, vocalising and restless. I brought the plug-in down stairs and for good measures used a pump of the travel spray on their beds. Within 5 mins both were fast asleep and neither were bothered by the fireworks for the rest of the night despite them going off until 1am. 👏👏👏👍👍👍 He accepted it does work very well!! This is a great buy as my dog is really highly strung and gets anxious with a lot of loud sound. Especially when there are fireworks going off it calms him enough so he can sleep. Used our new Pet Remedy plug in for Christmas Day, as all the family were here. Definitely noticed a vast improvement in our dog, she was pretty calm all day. The product arrived 2 days early , I have a rescue cat she is very nervous but within half an hour she was relaxing in her basket and purring when we stroked her , good product , p&p a little bit expensive . We have a 15 week old puppy and she’s absolutely bonkers, of course! As she should be! But we also have a 9 week old kitten, (because my hair isn’t grey enough), so in a bid to calm the dog down so she can meet the kitten without scaring the life out of her, I bought this. I have to say, she is instantly like a different dog. Someone on these reviews said it’s like the dogs’ true lovely personality can now shine through as it takes the edge off the more undesirable aspects of puppy behaviour. This could also be in line with us responding correctly to her behaviour and her learning very quickly that she mustn’t bite so hard, however I think it’s possibly a mixture of the two. She’s still a puppy, but so much more chilled out. I will be buying again. I tie these to my chihuahua's collar, they work wonders! My dog seems much calmer now, she is usually frightened of everything definitely seems to be working. This seems to work. My two cats since the arrival of my grandson have been urinating on our beds and carpet . Since this has been plugged in - NO MESS! Fantastic product used daily in my salon as a spray , we've sold many to our customers. its a very useful helping hand in the salon . Pet Remedy are a lovely company to deal with and are extremely helpful. Thank you very much . Sarah .Dog Grooming by Sarah Market Drayton. Brilliant product,highly recommend, works quickly,calmed all my animals down and my young one dog has stopped howling at night. Wouldn't be without it now! We've had some good results with this spray. We used it for some rescue cats we've rehomed and there was a marked difference in before and after using the spray and matching plugin. Finally, a pet calming product that works, I’ve tried a lot of others and had no success including the plug ins and drops to put in water and tablets and nothing has worked better than this has, when the fireworks were going off around the 5th November, we sprayed his bed with it and he stayed in his bed the whole night and not a whimper our of him, we had to keep checking him to check that he was alive still as he was so quiet! Pet Remedy is the best. I've watched ferals rubbing themselves against the sprayed towels. We would like to say a huge thank you to Gill from Pet Remedy for sending our ickle Zazu one of their heat pads & accessories to help us keep him warm in this cold weather. As many people know we have used Pet Remedy since it first came on the market and comes highly recommended by Sunny Harbour Cat & Kitten Rescue to help in a multitude of anxious animals, not just cats. We use it ourselves 24x7 at the rescue as well as in our shop Cat Care Centre Lochgelly from Sunny Harbour Cat Rescue where we often have samples to offer to customers pets in need. Great Results - Our young cat would never calm down no matter what, this product has great results, she is so much calmer now. Feline Hyperesthsia Syndro - I don't normally write reviews for things I buy, but I definitely think this is worthwhile if anyone is in the same position as me with my pet cat. My 7 year old male cat was diagnosed recently with feline Hyperesthesia Syndrome, which there is not an awful lot known about. He is prescribed gabapentin to keep his episodes at bay and make them less distressing, however I was told by the neurologist that the condition never fully goes away. When doing some research online on other ways I could improve his quality of life, one of the main suggestions coming up was to reduce stress. He is naturally a very anxious cat so this seemed like an impossible task. I came across these plug ins while looking for inspiration and thought "well, can't do any harm" - and I'm so glad I bought them! Along with his regular medication, the plug in has helped him so much and his episodes are much less frequent. He's a lot calmer and friendlier and it's really lovely to see. A lot of people mention the smell, but personally I think it maybe goes on a product by product basis. Mine is in the kitchen as he spends a lot of time in there (his favourite bed is on top of the fridge) and sometimes I notice it and others I don't. I don't find the smell unpleasant, it's just sort of earthy? The valerian is the most obvious smell to me, which I recognise having tried rescue remedy(for people) on myself. Hard to explain, but certainly not offensive. Would definitely recommend trying for anyone else who has a cat with this condition, or an anxious pet. I found this plug in helped to relax my dogs during the fireworks season. Whilst they still got distressed they weren’t anywhere as bad as in previous years. Have also found it stops my Bichon getting so anxious when I have to go out . I would definitely recommend this product. Great Product - Love it ..my cat is so calm now. Worked really well for our Cocker, who was having stress issues. Bought this to help with my Himalayan Dwarf bunny's aggressive behaviour. I'd already ordered this plug in before asking for advice in various care groups and we have been using it for a few days now. Toby is back to being cuddly and affectionate with us, for the first time in months. We haven't tried him with other animals yet as it us still early days but it's made an absolute huge difference. It was inexpensive and even came with a calming wipe to use if we need to transport him anywhere. I'm so pleased Toby is feeling more relaxed and happy again. I really would recommend this product to anybody who is struggling with aggressive behaviour or stressed out bunnies. Amazing Difference - I bought this in an attempt to stop our 1 year old cavapoo constantly barking (often whilst looking out the windows). I wasn’t expecting it to work but thought it was worth a try. Within half an hour of it being plugged in we noticed a difference and 24 hours later it’s like we have a different dog! She hasn’t barked unnecessarily and she’s been much more relaxed. It does have a slight smell but not unpleasant and not very noticeable. Cant recommend highly enough. I've used atomiser for house bunnies and great for calming after neutering. Just home from London Vet Show and picked up a Pet Remedy bandanna and spray for my anxious terrrier. All I can say is wow how chilled he is and happy too! Thank you! Have a very anxious breeding dog, spaniel, she's so sensitive to noise and fireworks scare her and send her under the bed. The vet recommended this and I thought it was a lot of mumbo jumbo but tried it and put it on...fireworks started and she fell asleep next to me! just couldn't have believed it but tried it the next night. The one night I was away at friends, we didn't' have it with us she started getting anxious, scratching the carpet trying to hide behind the tv. So its a must in my house and have recommended it to other pet owners. Better than adaptil....bought the spray as well, not tried that yet. Thank heavens for Pet Remedy! I used the plug in for our 47 wild hedgehogs in care here at Caistor Hedgehog Care out in the hoggery on a very loud bonfire night and it kept them calm with no losses to stress! Thank you!! Excellent product. Great customer service. Used to smell awful but not now. They listened to customers and sorted it. Would whole heartedly recommend. Thanks to Pet Remedy for assisting with this little lady. This is Finnegan; she's around four months and was found in someone's garden. The finder (her current foster mum) has a boisterous boy, and the diffuser has been set up today to see if it helps calms things between the pair of them. Hopefully it'll work it's magic on her foster brother. I was very pleasantly surprised, because it was really good. My Jack Russell is literally petrified of fireworks. In past years she has needed prescription sedatives & has wet indoors through the night. This year however, she was happy in her bed which was liberally sprayed with Pet Remedy Essential Calming Spray & placed in a dark corner behind my arm chair. She ate her meals normally & wasn't sick & she woke us up in the night to toilet ... I will definately be keeping a bottle of this stuff from now on. This was bought for my daughter's dog to help him cope with the bonfire night weekend. After having an anxious pup last year with fireworks I thought I’d give this a go. Plugged it in late afternoon to start it working. Fireworks started a couple of hours later, telly turned up a few noitches. Really pleased I picked a new Pet Remedy plug in at Luminos, not only was it Bonfire night my poor Boo, had spent 36 hours in the vets on a drip with pancreatitis and was home over night. Many thanks for the help and advice you gave me at the National Pet Show in Birmingham yesterday. My 6 month old kitten, Ernie was not dealing well with his first exposure to fireworks. Within an hour of putting in the plug-in, last night, Ernie was much more relaxed and calm, sleeping through the fireworks which still were being let off late last night. He was so content that he fell asleep in his play box on top of his fleecy blanket. Many thanks. I will certainly recommend this product to other owners and top up my plug in as and when required. So every year Ben’s fireworks phobia has gotten worse & worse to the point he paces up and down, crying & whining but more disturbingly as he’s trying to get away from the noise he jumped out of the bedroom window last year and this year the window is shut and the bedroom locked so he can’t get out that way although he just head buts the front door, which is very distressing as you can imagine. I’ve tried in the past calming tablets, calming liquid you add to the dog food, adaptil plug in and spray and getting Ben a thundercoat to wear. So this year knowing I had to try anything and everything no matter the cost I came across You... PET REMEDY who were selling a kit comprising of pet wipes, 200 ml spray, plug in, 15ml spray ( for when your out n about ) the set was £36.00 I was willing to try anything so when the kit arrived I was armed n ready! Saturday there were firework displays going on so I used a wipe and some spray and Ben was a different dog yes he was slightly agitated but he laid at my feet and that’s where he stayed for the 4 Hours it was going on. If I moved then Ben got up and followed me so closely I almost fell over him a few times but as soon as I sat back down so did Ben .... I don’t know what is in the make up of ingredients but THANK YOU SO VERY MUCH PET REMEDY I know where I’ll be getting more in the future and recommending it to all my doggy mates who go through the same. I thought I had tried everything for my extremely nervous dog who shakes so much at fireworks, storms etc but I tried this and the bandana with the calming spray and what a change in her! Yes she still shakes at the extremely loud fireworks but she now stops as soon as the fireworks stop as before she would be in a terrible state for at least 30-45 mins after they had finished! The last couple of nights she has just been so relaxed and stayed with me the whole time rather than going off to hide! I know every dog is different and it might not work for your dog but give it a go. I’m glad I did! I plugged this in when I got it and almost immediately our dog seemed calmer. He is not so stressed when we leave the house to pop out now. The smell seemed fairly strong when first plugged in but I don't even notice it now and didn't after about an hour of having it. Will definitely keep buying this. I got one of these on Saturday at the supreme cat show. With on hours of plugging it in at home I noticed a difference in my cats they was very relaxed. They didn't really notice the fireworks going off out side. To anyone thinking about buying one it's MUST! The smell of this is lovely, not overpowering or chemical smelling like so many diffusers are. I have noticed it has had some calming effect on my cats but it is being used in a large area so clearly the effect will be limited and is certainly better than other calming diffusers I have tried previously. I will continue using this product by purchasing refills because I would miss that gentle background aroma if it wasn’t there. I have absolutely no negative comment to make about this diffuser. Only had this for just over an hour. And my dog has gone from a shaking wreck (she literally sits and shakes all day long) to calm and playful. Tried lots of different things but none have worked except this. Haven't tried walking her yet but happy with how it's helping in the house. Started working in about 30mins. Two spays on bandana. Hoping it will help with fireworks and walking her as she is terrified of the outside world, loud noises, children, men, big dogs, fast moving objects, balloons, anything loud that's moves that's big lol and she's only small so most things are bigger than her. Serene um calm she's been on for a week and no improvement. So very happy with this. I have 3 Pet Remedy diffusers around the house. This wee girl always lets me know when it’s time to put in new refills and she instantly becomes a little angel again, much to the relief of her big sister. Big thumbs up to Pet Remedy. For years I have used felliway. I wasn’t sure if it worked. Tried this one because it says it’s natural, it seems to work with our four cats so I will use this make in future. honestly was really sceptical about diffusers, and I was worried they wouldn’t affect my dogs. I have a 7 month old pup who is petrified of loud noises especially fireworks. I honestly can say this worked almost instantly for my four. They settled down, and loud noises didn’t startle them, infact they stayed asleep and we jumped!! They seem much calmer now, and didn’t even flinch when a firework went off! There is a bit of a smell, reminds me of the plug in mosquito repellents but you get used to it and forget it’s there. It uses little electric (have a smart meter) and Is easy to assemble. I would recommend this to anyone with animals, especially around firework season. This has really calmed my cat. She no longer over preens herself and no longer runs away. Great as a calming aid with our rescue dogs. Seems to be working well - will find out when fireworks really start but bought it early to hopefully help prior to all the noise. Dog seems a lot calmer and happier in herself. Nice to have a product with natural remedies and no toxicity problems. Worked really well for a household with 5 cats. Very pleased with the purchase and as I write this review a couple of months after purchase, I can say that I have now bought the refills too. Thank you Pet Remedy. The smell is far less offensive than the dog's farts. The spray itself seems to have worked. I no longer have "I'd rather cower in my basket and feel pathetic than go outside and play because my dad isn't home for another few months". I spray a little on my hands and gently massage it around his head, leave him 5 minutes, and he (the dog, not the husband) comes prancing around me asking to go outside and play with his equally huge brother. No hesitation to recommend this (not least because it's cheaper than the other brands). Since installing this product my Jack Russell dogs have been calmer when balloons fly overhead. Will wait to see what happens on bonfire night this year! My two adorable gremlins enjoying the sunshine. Both rescues had the one at the back 4 years now now age 9 and newbie 18 months in the front who arrived last weekend after my boy sadly losing his friend a couple of months ago. Both settling in to the changes brilliantly with the help of pet remedy, thank you. Don't think we'd get threw bonfire night with are cat without PR ! First time we plugged it in, he slept next to it for hours and was so calm and relaxed. I rescue shih tzus & this is a god send for nervous little dogs it definitely has a calming effect. These are our pigs,the little brown one is Kevin. He’s a rescue piggy who arrived 2 weeks ago All the changes he’s had in the last 9 months have made him a bit snappy. After spraying his hut and surroundings with Pet Remedy spray we can definitely see a difference in him today. He’s a lot calmer and seems to be settling down with his new friends Peppa,Hattie & Babs! I have been using this for my Welsh collie for the couple of yrs. When there's thunder & bonfire. New year's eve. It's great. I can even put it on my sofa ( that's where she goes when she's scared) & it doesn't stain it. It really calms her so much she goes to sleep. Wouldn't use anything else. Have brought several, seems to work well, we have 11 indoor Cats, and 4 Dogs. All act so much calmer. Can tell when need to replace chemical. Price is very reasonable compared to other brands, and works for a variety of animals, not just ‘Cats’ or ‘Dogs ‘ like other makes. I use this for my stressy staffy and can endorse it. Works wonders for her. Seems effective. I spray a little inside my puppie's blanket which covers his crate, to help him settle. My cat had to have stitches the other day and has been confined to one room. I bought him home some wipes and he immediately started dribbling and loving life! Will be recommending pet remedy to all our clients at our dog grooming salon! I got a new tall boyfriend heavy on his feet.tge cats used to run&hide while he was here but the calming atomiser an hour or 2 before he arrived then while he was here, calmed them beautifully. I love this product! Pet Remedy is something I always use on my visits, especially with the slightly worried cats. I also see in practice how this product can often have a very calming effect on cats. I use the spray but it comes in a plug-in diffuser and handy wipes too. I've been using Pet Remedy in my own multicat household for a number of years now, and it is absolutely one of the reasons the cats co exist so well together. Can't recommend it enough. Two sprays on my dog's bandana was enough to calm him considerably. He was so stressed with a skin complaint on his neck and back but this really helped. I have an extremely nervous cat who reacted to our new puppy by spraying on the carpets. We tried other plug ins but pet remedy has made such a difference - he actually sits next to the plug! And no more spraying! So lovely to see him relaxed again! I am a dog groomer and have used these products just recently..unbelievable..the power of calm..
To the average person, this will look like a really boring photo, however, I wanted to document this, as this is one of the first times I've ever seen this girl eat from a bowl! She has lots of issues around eating enough food, lots of allergies, and normally has to go out on a walk to eat her meals, and even then often refuses. She also has to have treats for lunch and throughout the day to stop her from vomiting bile. I did mix in some of her treats in, and we use and stock Pet Remedy products to help the animals to be calm and relaxed, and do as much as we can to support each individual animal, but I'm pretty mind blown that she are everything bar about 5 biscuits (she was full up)! Hopefully this is a major step in the right direction! I bought a heat pad to keep newborn puppies warm. It's a high quality product which performs really well. The fact that you can detach the power cord make it really easy to fit between the bars of a puppy pen. The last pad I had didn't have that which was quite annoying! Fabulous customer service. Really recommend! It works though. I use it to help my doggy customers relax when they are being groomed. It is worth it for sure. It appears to have helped our two cats and may it continue. We will certainly be ordering more as required, shame it doesn't have a better aroma for human nostrils. This really helped my old dog with dementia and is now helping the other dogs now he has passed recently. I have 50 cats, all rescued. There are skirmishes, specially since we are in the middle of the moonsoons, so the cats are pretty much indoors all the time. I sprayed Pet Remedy in trouble making spots around the house. And I must say there was peace. So thank you. Following one of my cats moving out and living on the wall due to fighting with the others I had to try something. My mum told me about the spray so thought I would give the spray and plug in a try. I was massively impressed within a couple of hours all the cats were in one room and not a single hiss has been heard since. The cats all seem more relaxed and actually like each other again. Three tiny bottle-fed rescue kittens in India got to spend their first night ever on a heated pad last night. Thank-you Pet Remedy for the heated pads, fleecy covers, calming wipes and calming sprays which have now completed their journey of over 7000km to reach the 60+ rescue cats and kittens at Cat Sanctuary Goa in India. The small, the sick, the weak, and the post-op cats will benefit hugely. Their carers will have more time to focus on feeding, cleaning and giving treatments, rather than constantly filling and refilling hot water bottles. The terrified cats and dumped kittens that they rescue from the streets will be calmed more easily with the scents. A big thank-you from me, and from Sonia and her CSG team - and from the kitties of course! This is Pippa the Cavalier King Charles Spaniel trying the Pet Remedy shampoo system. It worked incredibly well, not only was she relaxed throughout her groom but her coat was left in beautiful condition. My dog was howling when I left her but she stopped when we started using the calming plug in. She's much calmer too. Love this item. Calms down both cats and dogs. Easy to use and great refill. I’ve just been made aware of your product and I’m already a fan. As a danish rabbit expert I would like to help other rabbit owners become aware of your product, which could benefit a lot of rabbits. I have a bonded pair of neutered rabbits. They have been living together without any problems for 4 years. I sometimes takes rescue rabbits in and get them spayed/neutered, vaccinated and healthy. Two days ago I took in a male rabbit, who isn’t neutered. My male rabbit reacts immediately and this has always been a problem. They aren’t in the same room, but the smell is enough for him. My rabbits started fighting, pulling fur and chasing each other like I’ve never seen before. I thought about the bottle of Pet Remedy I’ve been given by a friend and thought it couldn’t hurt. Honestly not believing it would help. Not even 1 minute after spraying my rabbit calmed down. I’ve never experienced anything like that before! They had been fighting for almost 24 hours and with a few sprays they were friends again and haven’t been acting up since! I need to tell people about your product! Oh and I also need to buy a lot of your products since it’s only a small 15 ml bottle. I was so very, very skeptical over this product but felt that we had no alternative but to try it. Our 4 year old cat had started peeing on the livingroom rug, bedroom carpet, bottom step of the stairs and on the kid's wooden train tracks. We could not work out what was worrying or stressing her and she did not have a urine infection. In addition she was hiding from us and we would also find large clumps of fur lying about that she had pulled out. We bought this and gave it a spray round the areas where she normally sleeps, where she had been peeing and where we were finding the clumps of hair. Do not get me wrong - this stuff stinks worse than many of the things I have smelled in my live (it kind of smells like a huge, wet, muddy dog) and after spraying it round I started to regret even having bought it. The smell doesn't linger for too long though. Within about 30 mins we noticed that our cat was spending quite a bit of time sniffing about where we had been spraying this stuff. I was convinced that she was about to squat down and pee, but she didn't. A little while later she came up beside me and snugged in. She has stopped peeing on the carpet and is much more affectionate. We found our other cat sprawled out on the sprayed area in a drunken stupor. I am not sure that this stuff will work for everyone's cat, and we still don't know what was causing our cat to do what she was doing, but she isn't doing it any more. Just purchased your Pet Remedy plug in, dogs are well chilled thank you. On the down side, I am really sleepy is that normal? Has really helped to relax one of my dogs who suddenly became anxious of being in the kitchen. Have also used the spray but prefer the diffuser. My cats love it . They really enjoy every single time . When they get too stressed I'm just using on them and they calm down and enjoy. Maya fell into our grooming salon by mistake having previously gone to another groomer. She had to begin with a severe fear and intolerance of the dryer to the point she would vocalise and attack it as her defence mechanism. Numerous de-sensitising sessions later and we are now able to fully groom her which is a miracle. This is down to Jillian’s perseverance, commitment and determination to help Maya overcome her fear and Jill our groomers patience, understanding and compassion. I tried the spray on my bonded pair of rabbits a couple of weeks ago. They have been living together for 4 years, but due to a not neutered male rabbit staying here for a week, they started chasing each other, pulling fur and acting up like I’ve never seen before. A friend gave me the spray a few months ago, but I hadn’t used it. Just three puffs in the kitchen and they were calm almost immediately! Honestly never experienced anything like it before. We used another well known product on 3 different cats who have lived with us over the years, on the advice of our vet. One cat actually sprayed the diffuser and the other 2 cats it did nothing for them. This time we have 2 rescue cats who are on their 4th home. One was highly strung and terrified and the other was marking on curtains and carpets. The vet even had to anaesthetise one of them to check them out before we were given them. We even hired a Pet Psychologist to help them. That helped a bit but we still had problems. Last year our vet recommended and used Pet Remedy in the surgery and what a difference. The cats became more settled and peaceful and we could not believe how good the remedy spray was. The cats were also became stressing out when we went away on holiday. We now use plug ins when we go away and that keeps the cats settled. We have now had these cats for 4 years and because of Pet Remedy they have a better, less stressed life. No more wet curtains! I have 3 cats (2 females and one male). The male is now 10 and since he was born has been a very soppy cat, very attention-craving and suffers with separation anxiety, seriously! He has got worse with age. As of late he has been peeing on the beds (AGGGGGGGGGGGGH!) and then developed a urinary tract issue (very expensive vet bill and a Veterinary diet). I work at the vets and saw this, but I bought this on Amazon as it is a lot cheaper - I also have the spray. It does have a strong whiff (especially the spray) but that's Valarium, and as it's a natural herb (not a chemical smell, which I hate) I can deal with it. The main thing is he is less stressed, as any stress brings on his issue. We recently had a new door chain (fly chain) fitted, and this is what started his recent episode of urinating in the house as he was stressed, hence developed the urinary problem. He has been petrified of going through the chain, whereas the others do with no problem. This has enabled him to be less scared of the chain and anything else that would normally stress him out. The smell is really not that bad, you get used to it, and we only occasionally catch a whiff. Very effective. Helped a lot for two upset cats. Would buy again. One of my 4 rescue cats from India, now living in Bulgaria with me, on one of his many Pet Remedy heated pads. These heated pads are very important to my cats, particularly for this ginger cat, Mango, as he only has one lung. When he gets tired he knows he always has a warm place to sleep. Samantha feels quite happy lying on Zoro’s (the dog) body wrap, which was earlier sprayed with pet remedy, due to summer thunderstorms in Greece! Works very well from my sometimes highly strung husky. Pet Remedy has been an absolute godsend for me over the last 5 weeks, my horse had a fall in her field at the end of April resulting in her having to be stabled 24/7 for the last 5 weeks. She’s usually extremely highly strung and in all honesty the thought of having to keep her in for that long was daunting, however I bought a bottle of the pet remedy spray from my local pets corner and it has worked wonders! It’s an absolutely amazing natural product that I would defiantly recommend to everybody! See below my previously scatty, stroppy and sometimes aggressive mare who is now a very relax happy girl! I can’t recommend pet remedy enough!! My little helper in cat rescue is the pet remedy spray !! I spray on the cloth in the cage and the cat stops "miaow"ing and relaxes until we get to the vet for neutering!! Brilliant, I just wish I had known about this years ago. My dog is terrified of fireworks & loud bangs. This spray helps him to cope with it a lot better. poor lexie lost her beloved Leo last year and pined. Having got a kitten after 5 months she wasn't having THAT, thankyou very much! We got a plugin...and hoped! We hadn't allowed for the fact that a middle aged cat might not want a 3 month old Billy Whizz in the house demanding constant attention and 6 hour playtimes! Pet remedy took the edge off all the angst...and they are now BESTEST FRIENDS ! This stuff definitely works. Tried Adaptil first time round. It's very expensive in comparison to Pet Remedy and is man-made. Pet Remedy is natural and so much more affordable. True - it stinks for the first couple of days but that wears off and you don't notice it. Takes affect on nervous dogs immediately and has no negative side effects. My dog is an extremely nervous boy and this is the first time he has been chilled out. Would definitely recommend. This is wonderful for my cats, I was recommend this by the cat rescue scocirty that I received my kitts from and they used it to calm the cats they rescued. It seemed to work well for them and helps my cats be less anxious. My kittens were initially federal , so very apprehensive but this intally helped them feel safer at home and I have confined to use it for the last year, espcaoly when I’m away . I recommend it to other people too and my friends have had great success with their pets too. I previously used feliway and it really don’t work . The only thing with this Is it has a very distinctive smell , like old socks that my partner hates. Personally I don’t car as if the cats are calm then that all that matters , and I notice they are more anxious without it . However I just admit the smell is inisally not pleasant for us humans ! FIRST ENCOUNTER with the new 3 step grooming product. I am not a groomer; but have a cocker spaniel girl with 2 week old pups. Daily washing of rear end and feathers are needed in the first few weeks after giving birth. The new mummy dog doesn't like being away from her pups and stands at door of shower and is impatient to get back to them. Yesterday, a warm summer day, I thought I'd give her a full wash using the new 3 stage products. You can't see the difference much in myphotos, but the softness and shine afterwards is very noticeable. HOWEVER, as a trainer mainly interested in the welfare of my dogs I noticed that the bathing experience was noticeable nicer for Zola, she stood calmly in shower, not trying to rush off back to her pups. So, once again, thumbs up to Pet Remedy for producing another product to help our pets live a happier less stressed life with us. I'm using the diffuser & spray for my very nervous kitty Bella. She and her sister Saffy have lived with me for over 4 years but Bella still panics if I move wrong! Pet Remedy just helps dial it down for her. Bella is in front. I am writing a great big thumbs up recommendation for this product. The example I am going to share is him wearing the spray on a bandana during a heavy thunder and lighening storm this week. In days past he would automatically run and hide cowering in the bathroom (his chosen safe spot). As you can see from the photos, with the aid of the calming spray he remain calm and relaxed. Wonderful. I would like to say a massive thank you to pet remedy, your hard work and support for rescues is amazing. I for one have seen a massive differance in our rescue dogs and my own using all the different items you guys sell. Makes all the difference in the world for the kitten and the five-year-old cat when I use these. The first time the older cat experienced one of these wipes, she rolled around on it as if it were catnip. I've tried the other name brand product here on Azon (the spray and wall plug-ins, which cost more), yet this product works much better for my particular cats. I also use the cat brainwave music album sold on Amazon. This company and it's wonderful staff deserve a 5* The products have helped our anxious kitty and his sister for as long as I can remember and they are 7now. The defusers emit a calming effect over our kittys and the additional spray at times of vet visits and visitors to the house help too. We tried the wipes during unexpected situations and these were exceptionally good for both of them. Martyn and Gill have been most helpful with questions always happy to give advice or offer a solution to try. Pleasant aroma. Peaceful interactions between my cats. Excellent product. Calms everyone down. Smells like freshly dug earth. A bit weird. But if it helps kitties I don't mind. I'm really happy with all your products. I use the spray every time I frame a stray cat for neutering until we get to the vet's. I use the tissues in my 1-2-1 dog training classes when I first meet with the dog. Hello we met at crufts & you asked me to let you know if it worked on our rescue staffy cross who was suffering really bad with stress. The diffuser & wipes have worked really well with her & my other two dogs are now so laid back. Only had the product a few days,l can already see a huge difference with our dog. I would like to tell you how impressed I am with the pet rescue calming spray! The 1st time I used it was on New Years Eve, in previous years I had put a thundershirt on my nervous dog. He now though I am sure assocciates the thundershirt with uh oh something scary is about to happen! So this last NYE as I had just bought my 1st calming spray I thought I would try it out. Wow. Rather than him cowering behind a partially closed door (which has become a safe place for him, even in a thundershirt) I found him floppxed out on my bed wearing his sprayed bandana, calm as calm can be. Amazing. Initally I had bought the spray as I knew I would be taking him across London via tube then train, and another train journey a few weeks later. I had taken him on a couple of mini tube rides leading up to this in training, like 2 stops and not even going underground. When it came to 'the big journey day' wearing his sprayed bandana, and a couple of sprays on my coat sleeve, he made the trip with a lot more calmness than I could of dreamt of. He even flopped his head on my chest during the tube ride. (I even think the spray I too was inhaling made me calmer as well). A couple of weeks later when I took him on the train, he was clam enough to settle in the seat next to me and doze for a couple of hours. I love this product. I will only use it for high stress situations, and now I feel freer to travel with my sweet little dog as I can rely on the calming spray to take the edge off his fear! The bandana donation you offer I will buy once the bottle of spray I have needs replenishing. I am a full time dog walker and I have personally seen how great this product is and I have also heard amazing results from my customers using Pet Remedy at home too. Highly recommended. Sooo pleased with this product. After reading some reviews I bought the plug in for my 3yo labradoodle who is nervous around my 1yo son. Within 2 weeks of use their relationship has totally changed they play together and no more nervous growling from the dog! I work in a vet practice and will definitely be recommending this to my clients! Cats love it and does seem to calm them a bit. I am biased yes, because I sell this product but I have SO much positive feedback on it it is unbelievable. I speak to hundreds of vets and nurses and I could fill the internet with stories of all the happy pets it has helped. Brilliant work👍🏼Pet Remedy a great product too, it helped my Dog through his grief when we lost our other Dog, his best friend😢and calmed him and helped him sleep at night. Omg I have been using pet remedy spray in the vet practice where I work for calming our inpatients. But the plug in has just wowed me beyond belief - I’ve had 3 x 6 wk old feral kittens for 4 days with very slow progress being made to tame them - I plugged in the pet remedy about 2 hours ago and i cannot believe I was just able to stroke every one of them and they all purred for the first time and where so relaxed couldn’t recommend this product more, it’s amazing !! I love this product it helps my cavalier with separation anxiety issues. I’m also I’m a veterinary nurse and we love this product at work use the plug ins and the sprays and it helps dogs, cats and rabbits settle and have more relaxed visit with us. What an amazing team of people. Helping out these dogs. As for pet remedy well I cannot speak highly enough. One if the best products I have ever used. Not only for my rescue dog but for the dogs I groom in my salon. Helps calm and relax them so much. Not to mention all the dogs at the local rescue I volunteer at. I am a Dog groomer in Torquay, I have lots of nervous dogs that really benefit from the Pet Remedy products, I use the De-stress and calm wipes and spray and also use the new shampoo/ spray trio includes de stress and calm pre wash, de stress and calming shampoo and a lovely de stress and calming leave in coat shine and conditioner. They really are fantastic products and I would recommend to any owners who’s dogs get stressed during grooming they really do work. Combined with extra exercise, the diffuser has helped calm down my two adolescent male rescue guinea pigs who were chewing at their c&c grids and just generally rather crazy. They had started to fight with each other and although the pet remedy hasn't helped with those two, it has helped me bond one of them with one of my older boars and they make a much better pairing personality wise. The diffuser does have quite a strong smell which I can understand why people don't like it but I got used to it after a week or two. This is great for anxious dogs. My Dog is frightened of wind and anxious in the car. And this works a treat. I've been using and recommending Pet Remedy for years now. Since you were introducing a very new product in a market dominated by another high profile brand. I honestly wouldn't use anything else. The fact that this can be used across nearly all species of animal makes it a world class game changer when it comes to calming our beloved pets. I don't go a week without suggesting that someone try the brand and watch in awe at the near instant reaction given by their animals. It truly is a remarkable product. I'm pleased that I have been able to watch from the sidelines as it took off and grew in to the trusted household name that it is today. You deserve all the praise you are given. There are thousands of chilled out animals out there benefiting all because of Pet Remedy. I've had this for 4 days now plugged in and so far it's amazing. My dog is 9 years old and suffers terrible with separation anxiety. When ever we go to bed or go to work she would shake before we leave and we would always come back or come down to pee all in the kitchen. Since I have had this plugged in not a single day have we come down to pee in the kitchen. So for so Good! She's like a new dog! We have a plug in for our dog and he’s so relaxed when it’s on , no barking / whining like he usually does so hopefully it’s working ! We are proud users of Pet Remedy products here at the RSPCA Harmsworth Hospital, and we recommend them daily to our clients. Bought this for my new cat to finally branch out of his acclimating room. Set it up before bed, woke up and he was happy and relaxed enough to follow me up and about the house. Was using the feliway spray but that didnt seem to work as well. Fortunately this has a nice natural scent and my timid cat is roaming around happily! This stuff has helped my anxious kitty so much. It has a bit of a funny smell but you soon get used to it and don't notice it anymore. The difference is amazing and it's worth every penny for my cat to be happy and confident. It's helped 2 cats get on better as well. I wouldn't say they were best friends but they'll both lie on the bed at the same time now and there have been a few nose bumps on good days. Definitely works, noticeable straight away,I won't be without the plug-in. I've used the spray for years, first with my Husky, then my horses, then the rabbits, and now the cats. Used with the dog after he broke his toe as a pup and adaptil didn't seem to work for him. The horses when I clip them. The rabbits when we can to go to the vets for checks or jabs. And the cats... Well, we don't ever have to worry about getting the cats in there carriers when it comes to a vet trip! The difficult bit is getting them out when we get home! We have a towel in the bottom of each carrier. 2 or 3 sprays (which is more than enough!) On the towel and the cats go straight in a settle down. When we get back home, we leave the carrier doors open and they just choose to spend a few hours in there relaxing. We also have the heatpad that PR do and we apply 1 spray to it here and there, followed by the cats trying to sleep on top of each other. We, and our animals, love this stuff! with natural products they will smell of their natural ingredients and this may not be loved by all owners but you aren't buying this for yourself or your benefit, you're buying it for your pet, so just because it's not the best smell for you doesn't mean it's a bad product! If your animal is in a stressful environment don't expect any calmer to remove the psychological stress of that situation the first time you use it! Especially if the 1st time you use it is in that situation! Use the product a multiple times before the situation arrives. Before you go out for a walk. Before cuddles or positive interaction. Teach them the smell means a positive outcome. If you use it straight into the stressful situation (firework night, a long journey) where they are very stressed, nothing but actual sedatives are going to be effective and your animal is more likely to associate a products smell to the bad situation! The oils PR use are known for their calming properties and I've seen it work time and time again, but you still need to apply common sense and husbandry. An environment they can feel safe in. The reason I've used it for years is because from the 1st use I could see results and the more I used it the better the results. It's also 1 product for all my animals! Does exactly what it says on the tin! Brilliant product, both my cats and dogs respond really well to this. I bought it to help my cats on a long journey abroad when we move house next month so needed to see if it worked prior to going. One of my cats rubs himself all over where I spray and then doesn't leave the bed! So I'm guessing it's a hit. Nuka loves her bandana, she is training with Dog A.I.D to become my assistance dog, we love the bandana and the wipes they work great for stressful situations and keep Nuka nice and relaxed. Miracle worker! Works a treat on my cats. Well worth having in stock. Thank Pet Remedy using some of your de-stressing products on Dogs in Romania via Paws 2 Rescue, amazing! Thankyou for our samples, hoping they will help Merlin stay nice and relaxed during recovery of his luxating patella operation in 2 weeks. Could not live without this product! My two cats are much calmer when this plug in is on. Amazing product! I recommend Pet Remedy to all of my clients at my dog training classes. It works in front of your eyes. Lovely smelling too. I keep a small spray with me at all times. The large atomiser is great to hang on the wall over a stressed dog. Works on people too! Pet Remedy is a wonderful product, I show my dog Tipsey but about an hour after we got back home from a show she would get very restless wanting to go outside where she will eat anything dirt, leaves until she was sick then she would be okay. I took her to the vet and they said it was stress and it would be better not to show her I tried tablets from the vets and every natural remedy I could find but nothing worked so I decided it wasn't right to keep showing her so Crufts was going to be her last show but thank goodness I saw the Pet Remedy stand there. Spoke to Gill and brought some and used it at Crufts and plugged the diffuser in as soon as I got home and a miracle happened Tipsey was very relaxed and calm. I used it again at the weekend after another show with the same result I am so happy I discovered Pet Remedy I would highly recommend it to anyone who has a stressed dog, I can continue showing Tipsey knowing she is no longer stressed and enjoying her day out. One of my two bunnies recently had to be taken to the vet as he was unwell. His bonded lady friend gets very stressed when travelling but Pet Remedy calmed her down really well. So much so that she decided to stay with him while he spent two nights in hospital. Afternoon chill out time for half my fur family. They love Pet Remedy. I have a plug in Pet Remedy diffuser in every room. I am a Veterinary Nurse and love Pet Remedy and so does my cat Neil. He hated the snow so I sprayed some Pet Remedy on his favourite stool and as you can see he goes dotty for it! Bought the bandana at Crufts works well at relaxing Banner. Oh WELL DONE , Martyn and team! well deserved ! My Lexie and the new kitten, Lily, are learning to get along at last - mostly down to Pet Remedy! Wonderful product! Once again Paws and Hooves BG is being helped by Pet Remedy. One abandoned puppy successfully integrated into our pack of 5 + abandoned Sansa. We would never be without this product in our house. As a long time user of Pet Remedy I am always pleased to meet the team at the shows throughout the year and take advantage of the great offers. At CRUFTS I bought another heat pad (so the two girls don't fight over them), and it came with some wipes inside. It was the first time i have had the wipes though, so used one to 'scent up' the heat pads cover and then just threw it inside the paper bag it all come in. Safe to say, its a product they can't get enough off. We've left the bag laying around and they take turns to sleep inside it. We still have the new washing range to try! I just want to share my successes with Pet Remedy. I am a clinical canine massage therapist and often get nervous dogs coming to see me. Since spraying both myself and the vet bed with Pet Remedy I find that the dogs relax so much quicker - its a real true calmer. Arlo, Tinks, Betty, Teddy, Tilly and Hatti, happy in their forever homes. All our rescues are fed a raw diet to ensure the best start for them, a big thank you to Natural Instinct for their continued support, without them we could not continue to do the work we do. We are also pleased to announce that Pet Remedy are also providing bandanas and a calming spray to help all our dogs settle once in their new homes. The best of starts for the best of dogs! I used Pet remedy on my old Siamese boy to keep him calm and it worked well. Sadly we lost him and after 5 months decided to get a kitten as his best friend Lexie was pining. All did not go well! Her attitude was " Don't want THAT ! want my Leo!" and she chased, yowled at, and bit the kitten and generally hated it. So I got a Pet remedy plug in, which calmed things down no end. Its not on all the time because My husband insists on everything being unplugged at night ! The cats are peaceful overnight but by breakfast Lexie is getting stroppy and irritated. By the time the plug in has warmed things up, she is much more relaxed and calm and remains that way...until my hubby unplugs everything - so we are using the spray in conjunction with the plug in now and things are settling down nicely- and peace has broken out! Thankyou Pet Remedy for an excellent product! As a dog groomer I see some very nervous/anxious dogs. As well as young puppies experiencing their very first Groom etc. Using the spray and also the calming plug ins help to relax the dogs while in my care. I also use this when I volunteer at my local dog rescue centre. Being able to spray the dogs bedding ready for their arrival I have found helps them settle quicker. Also when I groom them. A light spray above their heads helps relax them very quickly. It also helps me while grooming. Don't want to get too excited yet as it seems to be too good to be true but tried your plug in diffuser last night for the first time. After months of my elderly basset hound, shaking and panting at bedtime, followed by having on the door and crying, and waking up to a mess on the floor, last night she went quietly to bed! Long may it continue! Great product guys. Used it for several years now. Would recommend it to everyone. Thank you. After 11 yrs of confining my golden retriever to the kitchen during firework season/new year celebrations for his own safety, (normally digging rugs, pacing, panting, shredding window blind, scratching at door etc) Pet Remedy Plug in has changed my life! This is the first year I have sat in my lounge with him Peacefully on floor 2'-3' away from his pet remedy plug in - see photo in comments! Cannot tell enough people to try these products, previously used the spray which I loved but bought a diffuser as well at Crufts today to replace another brand that has had little effect on my dogs. Go on try it, it won’t let you down! This is Rubie, shes 2 1/2years old and a reactive rescue dog. Never in my life have I owned a dog like Rubie, she obviously had little socialisation as a puppy and gets very excited/frustrated when around other dogs. Shes very a very active dog so agility seemed like the best thing for her but her over stimulation caused an issue. I learnt of Pet Remedy and decided to give it a go! How right was I to do so! A few squirts of Pet Remedy and Rubie is a lot more relaxed and able to greet other dogs, a massive step from not being able to be across a field from another dog. We have a long way to go but now have a Pet Remedy diffuser in the house to help Rubie, and an anxious chewer I own as well, I have high hopes for the future with Rubie and agilty! Massive thanks for such an awesome product which has helped such an awesome little dog focus more!!! Once again, thanks to Pet Remedy, our abused foster husky Sansa is settling and is relaxed with the rest of Sharon Jones pack of 5. This is her neck after having an embedded prong collar (yes we know!) removed on Saturday. Pet Remedy never fails to work, thank you guys!!! This works. I have a very young border collie and this is the only thing that keeps him calm. Very noticeable difference if I run out for a few days. I've used Pet Remedy for ages and can always tell when it's run out because Amitayus (grey and white) starts getting more boisterous towards his sister Tara (all grey). Thank you, I love the scent and my cat seems calmer too! Seems to have helped my 5 year old border collie girl relax a bit. She can be a little anxious around dogs approaching her on walks but I've noticed a slight improvement. As someone else has said, not a miracle cure but it does seem take the edge off any anxious or reactive behaviour. I only gave this a 4 because the smell is quite overpowering in the first few days and smells like an old wet dog. A big thank you for changing the life of our rescue cat who spent the day hidden from view and only came out at night. I was recommended your product and bought a small spray, the results were amazing so much so that I bought a larger battery controlled spray. She is a different cat, still a work in progress but she comes to a call, plays in the sunshine and is a pleasure to own. 17-year-old Oscar posing. He can sometimes get agitated at night before he settles down, persistently making his bed. I have found that spraying this with Pet Remedy has helped, and for the last couple of nights he has worn his bandana sprayed with Pet Remedy. This has helped him settle. This was recommended by a vet nurse after I had difficulty rebonding two rabbits after one had been at the vets for a couple of days. It smells pleasant, is water based so safe if the rabbits lick it, and works quickly. Two happy rabbits again. Strongly recommend. This really works for my cat. I bought it when I decorated. This seemed to stress her out and she didn't want to be in the house at all. This really helped. She absolutely loves the smell. For her this is a bit like a catnip (which she isn't bothered by) equivalent. She often now goes up to the refill and starts sniffing or licking and trying to get it off the wall. She has succeeded before and I noticed her rolling round in wild avancent with it. I am thinking now of getting the spray and spraying it on some of her favourite toys and cat carrier for trips to the vet. My cat gets really anxious when we have visitors so I thought I'd try the diffuser and she absolutely loves it! It stops her pacing around and really calms her down. I've even leant it to my friend to try on her cat as she's moved house and she's noticed a real difference too. Would definitely recommend. This really worked for our GSD x Belgian Malinois. It is a temporary effect and lasts 1-2 hours. It is more affective after several doses. I found the smell difficult to live with, but other in the household were unable to detect a smell so this issue is very much for the individual. I have 3 cats and they are all rescue cats each with different emotional problems. They were always nervous of each other and that would often result in a fight or spitting and growling. This product has made a big difference and they all seem much more relaxed. I shall be buying it again. I am a Vet Nurse and have a regular extremely aggressive cat who visits my practice for various reasons. Most of my team have suffered a swipe or bite from this kitty. I gave the owner samples of your wipes to put in the basket on the way to us.. we also cover a blanket in the spray and place it over her carrier for 5-10 minutes before handling her and spray it onto our hands.. needless to say this has been a god send! She is almost fully handleable and no injuries since this protocol! Amazing! Easy to use. Smells a bit strong at first but seems to be helping my dog during her season and when we have lots of visitors etc. This seems to work very well on our cat. When we plugged it in, she went over to it and tood there sniffing it in for a few minutes. She seems to be doing so much better stress wise between this and the cystophan our cat is a new girl! I can highly recommend this defuser. We plugged it in, and within about half an hour we were already noticing a difference in our dog. He’s only 11 months old and a highly energetic Collie Cross, but with the Pet Remedy diffuser, there seems to be the real him coming out a lot more. I know a lot of people complain about the smell, but it is hardly noticeable after a while, maybe if you happen to be close to the diffuser you can smell it more. I have really got used to it. It smells of herbs, so not really that nasty. He also seems calmer and he becomes more cuddly and attentive. He’s still got his crazy moments, but it certainly calmed him down quite significantly. He’s a Romanian rescue dog, and I think that even after the four months we’ve had him, he still doesn’t quite know if he can trust us yet, so we’re really trying our best to get him feel relaxed and at home. The plug in has certainly helped to contribute to this, so I can honestly say that it works and I happily recommend it to anyone who’s thinking of buying it. We have also used the spray for the car, and that has helped as well. This is brilliant if you have stressed cats! These 3 love their new reversible pet remedy bandanas that come with a mini spray! I prefer this to fell away, it really relaxes my cat. All of donors including this gorgeous boy called Stanley were helped to feel nice and relaxed thanks to the Pet Remedy wipes. Been using this product for some time and it definitely works for my cats. The vials last for quite a long time, so it's good value. Just moved house and my cat wasn't coping too well so bought this instead of paying the ridiculous amount for the other brand. It took a while but my cat is completely different now. Will definitely buy more and will recommend to others. One neurotic cat was making himself a bit of a victim so was getting chased and stressed by one of the others. All calm within a day. Nervy one is blissfully relaxed so the other one has lost his sport. Yes it smells a bit but well worth it and you soon stop smelling it. Good value and it works. What a difference six months make! Do you remember Wolf and Wasabi...they were in to be neutered yesterday. As you can see, they were super relaxed and enjoyed the Pet Remedy plug in we have in our cattery. This works wonders on our dog when fireworks are going off, it's the only thing that's ever worked for her! Purchase from Chatham branch after my cat had surgery to an abscess on his bottom, having to wear a buster collar is a stressful time for any pet but particularly stressful for cats as they are unable to clean. He wouldn't leave the window ledge where he'd been laying since the previous night, I plugged in and spray a couple of squirts on the bed to try and encourage him down. He immediately sat up and moved to the bed, was purring/asking for cuddles which he hasn't been doing! Then to my surprise he let me clean him with some of the wipes I also purchased and then went for some food an water! He is now moving around a lot calmer which in turn is making the whole buster collar experience better, he also hasn't been trying as hard to get at his stitches! Overall I would recommend this product as it has work wonders for my vet poorly and depressed cat! Used pet remedy for my cat that would hiss sometimes at our other cat, she now goes up and sometimes gives the other kitty kisses!! Recommend 100%!! Works amazingly well on my cat that has separation anxiety. We also used it during a house move and it works like magic. We also use the plug in and he’s been a more relaxed and content kitty. When he exhibits bad anxiety or we know he will be in a situation that could cause him stress, we spray it on a cotton pad and wipe his chest and head. Within 15 mins he is calm and we have noticed it lasts about 2 hrs. We just reapply if needed. The smell is quite earthy, but doesn’t last and I’d rather know my cat was relaxed. We have tried other brands and tablets which did not work or had bad side effects. This all natural remedy spray is worth it and we are so happy to have found something that works so well. Excellent product, an essential for my cat while we are out. We used Pet Remedy in our charity. NEW START CAT RESCUE. It does smell a little but its benifits are unbelivable. Fantastic stuff. After the weekend of using the Pet Remedy diffuser and the spray, Heidi the Bengal is very mellow, she is walking by us and not moving round the edges of the room as much but still is, she’s even coming up to us when we sitting on the floor cleaning the litter tray she’s becoming more inquisitive (Bengals are though) and she might not be the lap cat we wished for but she is at least sitting a metre away from us not hiding away. Whenever we go to bed we spray her bed and she knows that’s a safe spot for her and goes to the scent. Pet Remedy has really turned my cat, Kougar, around. He had always been a great hunter and explorer but was attacked by a dog or 'whatever' in his hunting grounds and after his wounds healed he began to pull his fur out quite aggressively! I was advised to try the Pet Remedy spray and would spray it on my hands and then stroke it around his chest and 'chops' and he chilled out really well. I now use the plug-in and the spray and Kougar is a much happier cat. He's an old guy now (18yrs) so his hunting days are over but he still likes to be outside with the neighborhood cats and seems really happy.....I think thanks to the use of Pet Remedy. I highly recommend it. I bought this on recommendation due to my sensitive, reactive, nervous dog. Within 10 minutes of using it in the house, he chills out! We have used it on walks and although he is still reactive to other dogs, this has decreased and he is not as hyper towards them. I am pleased with the progress and I would say it is a useful aid if your dog suffers any of those problems. You need to spray it on a bandana or pet bedding and not directly on the dog. It smells a bit cheesy, but this is nothing to worry about and wasn't a concern for me. I will definitely be using this when it is firework season and I am really quite positive that it will help calm the dogs anxiety. I have a very anxious 4yr old German Shepherd Dog called Conan. I started using your diffuser about 18 months ago when I moved house and seeing how easily he took the move in his stride, I continued to refill the diffuser. Last week it ran out and I didn't realise. Conan ate the majority of my house contents including TV wires, wooden spoons, a large plastic container, a month's supply of my other dog's Renal prescription food, my own pre-prepared dinner and lots of citronella candles. Here is a photo of him getting X-Rayed in work (I'm an RVN) to check nothing was stuck in his stomach and intestines. Thankfully it was all clear. My (multiple) refills are on the way in the post and meanwhile Conan's list of destruction continues to grow. He's eaten his own large food bin and the food inside, and in between constant pacing is digging unsuccessfully on my bathroom and kitchen floor. It's distressing for him and distressing for me to watch. So folks, Pet Remedy really does work, but best not let it run out...! For me at home with Stan this product was simply life changing. He was finally able to relax enough to form a bond with us and learn to be part of the family. Since then I have used it with 100s of customer's pets and it has never let me down! Fab for separation anxiety and settling new pets into homes and an invaluable tool at firework time. excellent product. I am using it as I have new Siamese kitten in the house and normally there would be serious hissing and spitting from the resident Siamese...this is normal hierarchical behaviour for cats but can be unnerving when the kitten is so tiny and you don't want it hurting....after a week, things are calming down nicely with Pet Remedy. And I know its working cos hubby unplugs EVERYTHING at night....including the plug in. By morning there is a little tetchiness which melts away as the Pet Remedy does its thing within an hour. Highly Recommended ! Just a bit of a back story with our new Bengal Heidi, she is 7 years old and an Ex breeding cat with several litters behind her when we saw her with her spots and green eyes we knew we had to rescue her. Two weeks later she is still extremely nervous of us and only really likes it if there is one person in the room with her. So this is day one with the Pet Remedy diffuser and Heidi the Bengal is very calm and starting to approach us but it’s all baby steps can’t wait to have her on our laps purring. Does work.Stops cat peeing in the house. For a start I flew 1 rescue dog and 4 rescue cats from India to Europe, rubbing the Pet Remedy calming wipes on their flight crates to help reduce the stress of the journey. Awaiting us in our new house in Europe were 3 Pet Remedy Heated Pet Pads to help the cats adjust to the new cooler climate. I leave these on 24 hours a day, and while the cats actually love the snow outside and are much more active in the cooler weather, every pad is used everyday - I have scattered them around the house. I keep one room at about 28C temperature for them, but still they like to go into the cooler rooms and sleep on the pads. Even my 32kg dog likes to lie on one and it is good heat therapy for him as he is slightly lame in one knee. I soon picked up another kitten who was lost, so took the opportunity to order a 4th heated pad. And a calming diffuser and a spray and more sachets... well, the list goes on. 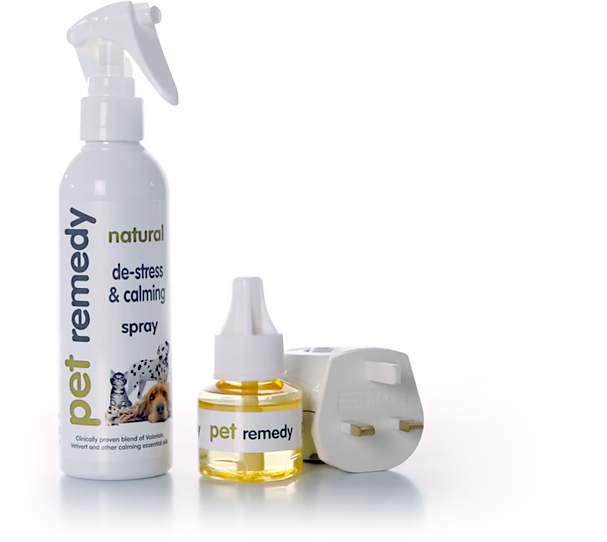 Pet Remedy have a focused set of products, all targeted on pet wellbeing - warmth, reassurance, security and relaxation. In India we used incense for fragrance on occasion, but we could only use it outside or with all the windows open as the smoke/scent is not good for pets in a confined space. Now, in Europe, I find myself surrounded by the fashion for scented candles and home deoderisers instead. Many of these contain fragrances, chemicals and aromatherapy oils that are toxic to pets (e.g. pine oil). My cat has only one lung, and my dog's nose was bitten off by a leopard, so there is no way I want to make the air in their new home damaging for their lungs or bodies. But we can't have all the windows open here on account of the winter cold. So, INSTEAD of using scented candles or incense, I am now using the Pet Remedy calming diffuser. The house is nicely scented, the pets are happy, and most of all they are safe. My Indian cats do not respond to catnip at all, so it is interesting that they all respond positively and noticeably to the calming wipes / spray. My biggest cat, 8kg Tim Nice But Dim, tears the wipes apart in delight, so I have to put them out of reach. When I wipe them on the cats' beds, they all rub and roll on the beds. Every item I have bought from Pet Remedy is responded to and used by my animals in a positive way for them. What more could you want. One of my cats had terrible anxiety which led him to licking a lot of fur off his back, the vet suggested we tried the Pet Remedy Diffuser. It’s definitley helped, it’s made a massive difference to my cat and you can notice how much more relaxed he his. Anyone who has a pet that has anxiety or is stressed give this a go! Wish we had found it sooner! Best thing I ever bought for my collie, very nervous around bonfire night.. but this helped keep her calm and not freak out as much as she always has. Bluebelle is wearing a pet remedy wipe as she's not happy with the storm raging outside, it seems to be helping and the other dogs are all calm from it too. This definitely works. Been using it for a while now on our over grooming little stresshead cat. She was a rescue covered in scabs and no hair. 2 squirts on a bandana every night and it does the trick... hair growing in nicely -have to agree with other reviews it's not the most pleasant of smells but who cares? It works! My rescue pointer has been with me a few days. I’m using the plug in and he is so calm I’m amazed. We used it this year ....it really worked. Daxi ignored the fireworks and went to sleep. I used plug in for first time last night for my two jacks , who had taken to barking at four in the morning through until we let them out at 6 , so pleased to say that it worked!!! They did not bark until 6 I’ve just had a good nights sleep for the first time in over a month. Thank you so very much , highly recommend. It really works! Our dogs are terrified of storms and fireworks but just a few sprays and soon they are much calmer. I highly recommend It! we lost one of our Siamese, leo to Kidney failure in the autumn. Lexie misses him so much and recently started biting the furniture,ripping at cloth and getting really angry and frustrated. I had a had some Pet remedy and sprayed her bedding.....she is calm and loving again. I cant praise Pet remedy highly enough. My bottle is a couple of years old now - how long is it good for - because we are collecting a siamese kitten in 2 weeks and I need to be sure Lexie will remain calm and not take against her. She really needs the company! Recommended by my veterinary for my two nervous rescue cats + the 'skittish' female whom tends to torment the boys as and when she gets the chance, so far so good this product has worked wonders, definitely recommend for use in multi-cat household. We brought pet remedy about 3 months ago (have replaced for its 2nd one) and it has helped our nervous cat, who gets picked on by her 2 brothers, and it chills them out so they don't chase her too. I wanted to share with everyone this before and after of my own cat Niss. She was over grooming and had pulled a lot of hair out. I plugged in Pet Remedy just over a month ago and am amazed at the difference it has made. Pet Remedy is a natural way of tackling stress and anxiety in all mammals and works by mimicking our pets own natural calming mechanisms. Please come and speak to us in the Groom Room, or comment below, if you have any questions about how this product could help your pets. I can not recommend this product enough. My cat was over grooming and within a month of using the plug in she has stopped and her hair has started to grow back. Now this pet calming stuff is great. Having been rather dubious about using such things I made sure I was only using those based on 'natural' products. I now use sprays, diffusers and drops to great effect, can't say which is doing the most good as they are all in use at the same time, but a great range. This stuff is a "Godsend" we have a hyperactive Great Dane Cross and was told about this spray, now wouldn't be without it!! This spray is so effective in calming my senior dog, when he is in distress, a couple of squirts and he calms down within a minute. I have also used it on my young dog, when he was distressed over men pheasant shooting in a nearby field. Love this product. Really calms our puppy and a better price than the vets. My dog has always been very stressed, and after a recent back injury she was terrible.From the moment I plugged it in she calmed, and has had some long deep sleeps.It certainly works for her!! do think this works. i spray it on dogs bandana and she def calms. No problem.... I would recommend these products to anyone that has a stressed animal... I tried it with my cat on bonfire night... worked wonderfully!! This product is the Bees Knees. our little kitty is off the steroids and Pet Remedy keeps him calm used it for a few yrs now. I get pet remedy products from my vets. My female cats were marking on my bed during introductions. This really calmed them down and we have no problems now. We still use it now as we’re introducing another kitty or for anxious vet trips. Recommended by our amazing vets, it really has made our 5 strong cat family live in better harmony actually making Rosie so much more happy and relaxed after 9 years amazing, and Tom and Soxs can walk past each other without issue. I'm an RVN, I recommend Pet Remedy as I've seen it really help a neighbour's cats who don't travel well. my Siamese were terrified of Fireworks - not any more! Greatest thing i have ever used calming Ellie when it was Bonfire night no more tranquilizers from the vets. It worked a treat. Thank you pet remedy. It really helped Stanley with the fireworks. My OH poo pooed the idea & wasnt even interested, i think i badgered him that much & made him feel guilty, citing poor Stanleys nerves etc etc. Lol. He got him sum the day before i was goin to & it worked an absolute treat. He sed Stanley wont wear a bandana!! But he did with the spray on it. My OH had to admit it in the end!! This was really good. I purchased when I moved home to settle my cat. The product lasted a few months as advertised and seemed to have a calming effect on my cat, helping her to settle in. Had new pup and cat would not come down stairs to eat and do her business, vets recommended this so I brought 2 of these and placed them strategically downstairs I also wiped a little of it over the dog and also over some furniture, bedding and new toys. She now eats, sleeps and does her business where she should. Brilliant product. Only had to use it a few times when I adopted my newest cat, then everything was fine. Have recommended it several times to others. I volunteer for Cats Protection in Edinburgh and have found it to be calming for reactive /Feisty wee cats. Couldn’t rate this any higher. Absolutely excellent product. Effects are almost immediate. I run a small cattery and all the cats respond to it. I recommend this to everybody. Really helps all the cats settle in the cattery and spray boxes for travel home. A lot of my clients have this now for cats that travel badly in the car. Purchased this for our rabbits who get very stressed when being taken to the vets. Sprayed in carrier before we took them and at the vets they were the most chilled out I’ve ever seen them! Even the vet commented how chilled they were as opposed to their last visit. Definitely recommend this and will keep a stock in fir those stressful times. I use this all the time for my 2 cats. I rate this higher than any similar product. I foster multiple cats and all of them have a positive reaction to this product. Especially in cat carriers used for vet trips. The plug-ins also work but the effects are more subtle. I bought this for my friends dog who was extremely anxious due to being attacked by two different dogs and then to top it all off, the fireworks around bonfire night. She has reported back that it really seems to be making a difference and her dog seems calmer and less anxious. Really works!!!! My animals are instantly chilled!! Perfect for fireworks or new animal arrivals!! My dog loved this! I had gotten a few noise complaints at my apt complex, but after getting this my neighbors have told me they don't hear my dog barking anymore! I was very skeptical of this product, but my dog rubs his face on the wall above where I have it plugged in! Very happy with this product! My one year old house cat has gotten to that mischievous naughty stage. At times he can be ever so cuddly and loving, at other time he's opening drawers or my work bag, emptying the contents and hiding objects. Amongst other playful and curious behaviour. After the cuteness of what he was doing subsided and the repetitive retrieving things from around the house got tiresome, I tried this product. Within a couple of days his mischievous behaviour decreased. He still has his little personality but is much calmer. If only this worked on boyfriends too! Wanda and Daphne would like to thank Pet Remedy for the wonderful donations that have been received. Wanda will benefit from the heat mat with her wonky legs and we are using the calming wipes and mat to help Daphne with her anxiety. Used this to help some of my pigs who's got a bit wound up by something.......never found out what and one got really wound up tried this and it really worked well!! Putting a few drops of this on the necks of rabbits helps reduce aggression and helps with the bonding or re-bonding process after trauma or upset in any way. I highly recommend it and always have done in hand. Have tried Feliway and can say Pet Remedy Calming spray/defuser is more effective. It worked well on Firework night. Thank you. excellent service, product arrived within 3 days, I was sceptical, but with 2 nervous dogs that do not like fireworks , I gave it a try, with superb results.I would recommend this product to anyone, very happy. Wasn't holding out much hope, but there was a marked improvement on how calm our dog was, last year she was frantic.... panting and hiding while the fireworks were going off. This year she actually slept through the Saturday ones and on Sunday 5th she was aware of the noises however was much more calm. Definite improvement and I would recommend purchasing this product. Pet Remedy works amazing on my cats and rabbits, especially over the bonfire period, however it wasn’t so useful for my 11 week old collie puppy. The smell isn’t too great either but works really well so can’t complain. Have already recommended to friends and family. Can’t recommend this highly enough for anyone with stressed out pets. We have cats and dogs and it works brilliantly for them. Thank goodness for pet remedy this firework weekend. Ellie my little terrier who gets so up tight at the least bang slept through no tranquilizers from the vet. This was great as her fear travels to my other two so they all got a squirt. 3 chilled out dogs. I have used Pet Remedy Natural De-Stress Plug-in before (for over two years) and have found it very beneficial in calming my two cats over the firework & New Year celebrations. My cats seem more laid back & less stressed. I cannot rate the product too highly. :O Works a treat on our mental cavachon. Especially when he is on nighttime walks. I purchased some more pet remedy de-stress & Calming spray from yourself at the NEC today. The smell is so much better than the first bottle I purchased over a year ago. Still both fantastic and calms my Great Dane Beau during fireworks and windy weather. this product is awesome I have 5 cats and the brothers picked on their sister until I plugged the product in now she can wander around the place without fear. well worth the 5 stars. Working realy well for our cats who used to fall out.